Pineapple Upside-Down Cake simplified with a cake mix and kicked up a notch with the addition of rum in the brown sugar topping. Super moist. Super delicious. Super duper. Preheat oven to 350. In a small sauce pan melt the butter. Stir in the rum and pour into a 9 x 13 pan. Sprinkle salt & brown sugar evenly over butter. Arrange pineapple slices on brown sugar. Place cherry in center of each pineapple slice, and arrange remaining cherries around slices; press gently into brown sugar. Add enough water to reserved pineapple juice to measure 1 1/4 cups. In a large bowl, combine cake mix, pineapple juice mixture, sour cream, oil, eggs, and vanilla. Beat on low until moistened, then beat on medium speed for two minutes, scraping sides of bowl occasionally. Pour batter over pineapple and cherries and smooth the top with a spatula. Bake 40 to 45 minutes (42 to 48 minutes for dark or nonstick pan) or until toothpick inserted in center comes out clean. Immediately run knife around side of pan to loosen cake. Place heatproof serving plate upside down onto pan; turn plate and pan over. Leave pan over cake 5 minutes so brown sugar topping can drizzle over cake; remove pan. Cool 30 minutes. Serve warm or cold (I prefer cold with a little whipped cream). Store covered in refrigerator. Veronica’s note: If using table salt, decrease to 1/8 teaspoon. To streamline things a little more, you can just use a stick of salted butter and omit the salt from the recipe. 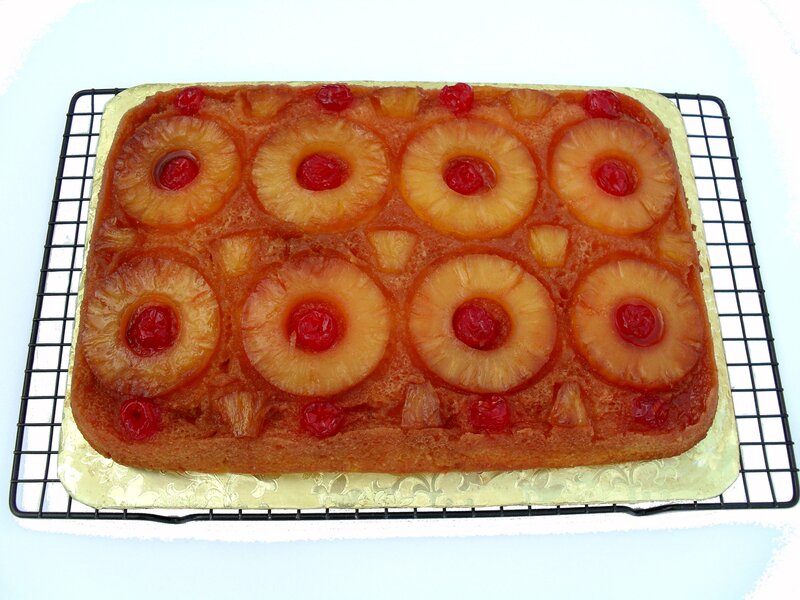 Posted in Cake & Frosting and tagged easy pineapple upside down cake recipe. Bookmark the permalink. I’ve never made one of these but I have like 3 recipes saved and I SO want to make one! I just need an occasion now! It looks so good! Thanks! This is beautiful! I love the addition of rum! Haven’t made one of these in a very long time! Nice!! I love how this starts with a cake mix–and yes, I’m a big fan of the rum too. Looks delicious! I have never made a Pineapple Upside Down cake before! I responded to your comment on my blog about Vegas. :) Vegas changes all the time! It’s different everytime I go and I go a lot!! And I LOVE Vegas buffets!! Sad I didn’t make it to one this time! Yummmy, I have never used rum before. 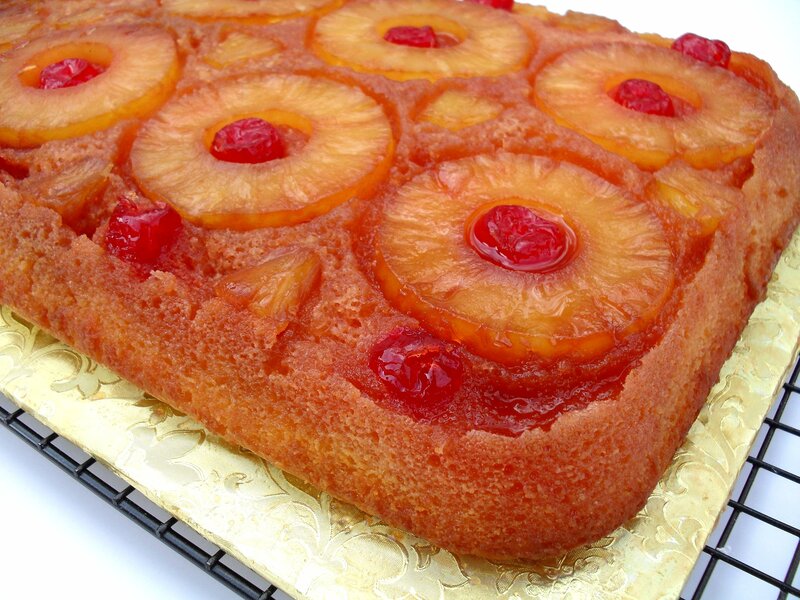 I will probably try this as I love pineapple upside down cakes anyhow. Thanks. What is the difference of time baked? Oh my, I missed this comment for almost two years! I’m so sorry! I’m so glad you and your family enjoyed it, and I agree two round cakes would be easier to handle. Good thinkin!